The iPhone 5 is set to sell like gangbusters. Every analyst on the planet has already voiced his or her opinion on the phone's expected sales during the first month, heck, even during the life of the product. That's great, I hope consumers dive all over it and get what they want. But I don't want the iPhone 5. Maybe it was the leaks that killed it for me. I feel like I did when I snuck under my parent's bed when I was five or six and found all of my Christmas presents. I feel like I did when I realized, at that very moment, that Santa wasn't real and would never exist. And don't get me wrong, I think it's going to be insanely successful. I think Apple will continue to sell millions of iPhone units and will continue to catch up to Android's market share, that could change, though. IDC, for example, suggests Windows Phone will surpass iOS by 2016. When TechnoBuffalo reviews the phone, we'll review it for what it is: a new smartphone on the market. If it's great, we'll give it a great rating. If it's not, we won't. This is just my personal opinion here, and I like surprises and advancements more than I do seeing leaks. This is, of course, if we take those leaks as the real thing, but this far in and with so many it's hard not to. See, I think the big misconception is that Windows Phone 8 and Android 4.1 Jelly Bean are playing "catch up" to iOS. That's really not the case. In fact, both operating systems are doing their own thing, separate from one another and separate from iOS. I think both are pushing the boundaries a little harder than Apple is, too. You can find, for example, 12-megapixel cameras on Sony devices, NFC in tons of Android devices and in future Windows Phone 8 phones. Both offer tight integration with social networks already. Android offers removable batteries and removable storage in many devices, two options I require in a smartphone. Windows Phone 8 will offer removable storage, too. Neither are playing catch up, they are playing their own ballgames. The benefit to not being Apple is that, as a manufacturer, you can flood the market with smartphones packing tons of different feature sets all year long. Android and Windows Phone manufacturers, in some regards, are like shotgunners just spraying buckshot across the market while Apple takes its aim and fires one single sniper shot each year. You may argue that the Galaxy S III doesn't offer the same build quality or engineering prowess as an iPhone. Sure, it's plastic and it might feel cheap, but I'm OK with that because it actually isn't. It doesn't shatter when I drop it. If you want a super slim Android phone with a ton of power and an even more sturdy industrial design, check out the HTC One X. See what I'm getting at? There's a selection. Apple is innovative, don't get me wrong. It's probably the most innovative company on the market when it comes to creating mass adoption of new technologies. Google Wallet pretty much floundered, but I bet Apple's NFC solution takes off fast. Developers are just now warming up Windows Phone, and have already been on board with Android, but Apple created the idea of a real, active and amazing application store. It did the same for music and video consumption on mobile devices. Apple created FaceTime which is a reliable voice-chat system that spans multiple platforms. Heck, look at Siri – everyone on the planet is trying to copy it, including Google and Samsung. Apple is nearly perfect at executing on innovation while others typically struggle to keep up. But that doesn't mean those innovations from its competitors should be overlooked. In fact, those other innovations are what keep me going back to Windows Phone and Android. Android was also the first to deliver a notification shade to the market, which everyone loves. It improved that feature in Android 4.1 Jelly Bean, too. Apple added a similar alert shade, and I dig the widgets inside of it, but it's not as complete feeling to me. Android also first brought us mobile payments in the United States, through Sprint's partnership with Google Wallet. That's an amazing first step and we're going to see mobile payment options flood the market very soon. Google likes dipping its feet in new waters, and I respect that, even if Apple ultimately prevails. That brings me to Windows Phone 8. I don't think I've ever seen a more beautiful and easy to use mobile operating system. It's fast, shows all of your content front and center, whether it's the weather, the latest sports scores or a message from Facebook, it's all on the homescreen. It feels alive. There's no digging with Windows Phone 8, in fact, there's only a homescreen and a menu list. You don't even need folders. It's clearly super efficient, too, because it doesn't require a dual core processor to run (although we'll see support for that in Windows Phone 8). Nokia went out on a limb with Windows Phone and created the amazingly beautiful Lumia 900. I think it can be improved in a number of ways, the camera isn't that great and I wish it had a microSD card slot, but it still pushed Windows Phone further than it had ever been before. There are also already Windows Phone and Android devices running on 4G LTE networks in the United States. Apple is way behind getting on-board with LTE, likely because it's trying to perfect battery life, but we've already seen devices such as the DROID RAZR MAXX that are capable of going all day long with an LTE connection. The One X and Galaxy S III aren't half bad either. Without Android or Windows Phone, we probably wouldn't have 4G LTE devices yet. That's a pretty crazy thought, isn't it? I like big screens. The Galaxy S III is right up my alley with its 4.8-inch display, but I actually really liked the 5.3-inch screen on the Samsung Galaxy Note and I can't wait to see what the 5.5-inch screen on the Galaxy Note II is like. I also dig the beautifully vibrant colors that Super AMOLED HD displays provide, something that I won't get with the iPhone 5. The iPhone 5 will probably offer an incredible industrial design that's far ahead of its competitors, but it, again, doesn't offer the hardware specs that I want in a smartphone. 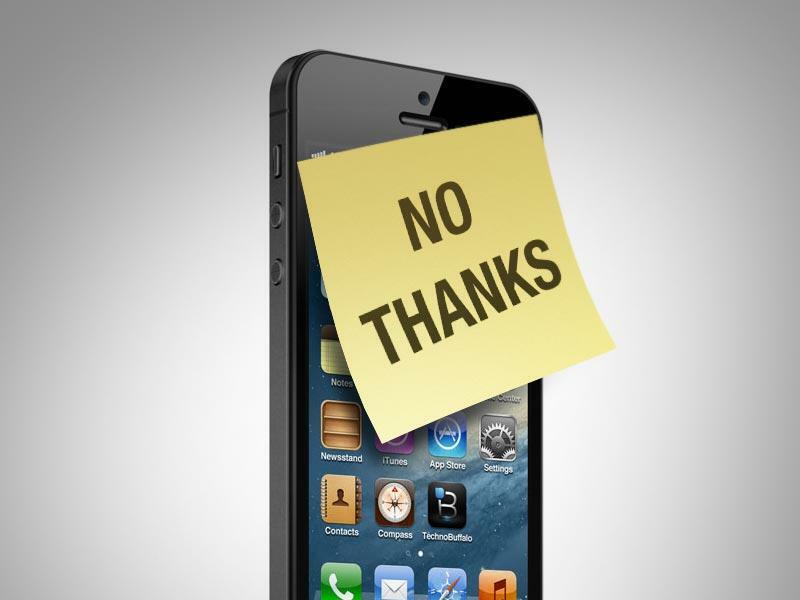 Maybe it was the leaks, or maybe it was the iOS 6 letdown that has me turned off from the iPhone 5. But it's more than that. I think I'm more excited to hold out and see what Android 4.1 Jelly Bean devices offer later this year and what Microsoft and Nokia have in store on September 5th. I'm excited to see what other advancements are made during the entire year that Apple has to build its next iPhone. The nice thing about being a technology reviewer is that I get to sit right inside the smartphone market and watch it change around me. I can walk to any stall in the market and check out any device and hear the cheers and the boos all around me. There are a lot of people cheering for Apple, there are a ton of people at its stand buying its products. But I like browsing the others to find the gems that, while sometimes imperfect, offer something the iPhone doesn't.